Greens Farms Academy senior basketball players, from left, Henry Holzinger, Jackson Boolbol, and Bennett Close during their final regular season game last Saturday. Two Greens Farms Academy wrestlers and one coach left the 2018 NEISWA Prep Tournament with some hardware over the weekend. Freshman Nico Provo (Stratford), at 106 pounds, and junior Griffin Seyfriend (Westport), at 120 pound,s both won New England championships at their respective weight classes. Adding to the spoils of a successful weekend was GFA coach Jack Conroy earning New England Independent School Wrestling Association Coach of the Year honors. The Dragons placed sixth overall with 91 points. Belmont Hill won the title with 187 pounds while Brunswick was second with 170. GFA’s two championships matched four other schools for most in the tournament. Provo was dominant all weekend. He went 4-0 in the tournament, pinning all four of his opponents. In fact, it only took him 16 seconds to pin his opponent in the championship match. Provo only spent two minutes and 17 seconds on the mat over his four matches, winning in pins of 58 seconds (Round of 16), 30 seconds (quarterfinals) and 33 seconds (semifinals) leading up to the championship match. Seyfried, meanwhile, also went 4-0 on the day, with three pins—all in less than a minute. He won the title in dominant fashion, though, earning a 13-1 major decision. At 113 pounds, CJ Shea (Milford) placed second. He was pinned in 36 seconds in the final. He won by two pins (58 seconds, 3:03) in the first two rounds before notching a 5-3 decision to advance to the championship match. Senior Sam Stuart (Fairfield) finished eighth at 126 pounds. Seeded seventh, Stuart won his opening match with a pin at 5:05. In the quarterfinals, though, he was pinned in 2:11, falling into the consolation bracket. Stuart bounced back to win his first consi with a pin at 2:54, but fell by 10-3 decision to end his day. Nick Attai (Bridgeport) went 1-2 at the 138-pound division. He won his opening match with a 10-9 decision, but fell in the quarterfinals in a 28-second pin. He lost his first consolation match in 2:01. JC Foster (Darien) competed at 152, falling in his opening match in 1:51 and 3-0 in his consolation match. Conrad White (Southport) competed at 170 pounds. He was pinned in his opening around match in 3:22 and fell in an 8-4 decision in his consolation match. Sixty teams competed in the event with 44 teams scoring. The Dragons bounced back from back-to-back losses to end the regular season with a victory on Senior Day on Saturday. 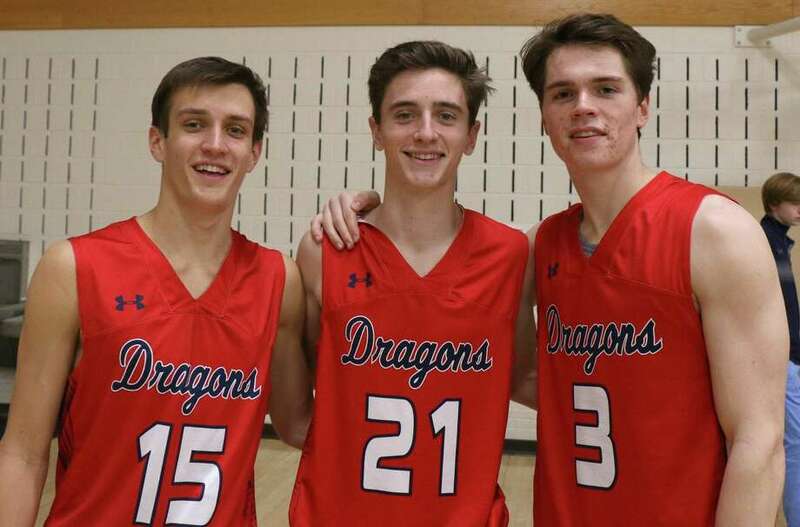 The three senior members of the team went out as winners in their final regular season game as the Dragons topped The Gunnery 72-64 at Coyle Gym. Henry Holzinger (Westport) tossed in six 3-point shots en route to 26 points while Bennett Close (Norwalk) and Jackson Boolbol (Greenwich) were also honored pre and postgame. The seniors get one more shot to play at Coyle when the Dragons host Hopkins in an FAA quarterfinal on Tuesday. Cole Prowitt-Smith (Fairfield), a junior, poured in 30 points, grabbed 10 rebounds and dished out eight assists to lead the Dragons effort. Holzinger also had five assists. Earlier in the week, even without one of its top scorers and best rebounders, the Dragon proved how tough they can be on the court, falling to top-FAA seed Hamden Hall by three points at home, 63-60. Holzinger drained eight 3-point shots en route to 26 points while Prowitt-Smith tallied 13. Max Mitchell (Westport) and David Basich (Westport) added six points each and TJ Holloway (Orange) added five. Prowitt-Smith added 10 rebounds while Mitchell chipped in with nine and Holzinger finished with seven assists, meaning he had a hand in 40 of his team’s total points. After playing one of its best games against the league’s top team at home earlier in the week, the Dragons hit the road and fell at Brunswick, 65-56. Prowitt-Smith tossed in 23 points while Holzinger added 13 and Close 11. Close had nine of GFA’s 16 rebounds while Prowitt-Smith had five assists. The Dragons sent their four seniors out as winners on Coyle Gym, celebrating Senior Night with a 47-32 win over Hopkins on Thursday. Hannah Kozdeba (Shelton), Alex Wagner (Southport), Bella Litt (Darien), and Molly Mitchell (Southport) played their final games at the Coyle. Junior Katherine Marcus (New Canaan) led GFA with 24 points while freshman Georgie Grabowski (Stratford) added 13. Litt finished with five, Kelly van Hoesen (Greenwich) had three and Sarah Peltier (Stamford) tallied two for GFA, which raced out to a 30-9 halftime lead. Van Hoesen had 10 rebounds for GFA while Marcus (3 assists, 3 steals) and Grabowski (3 steals, 3 blocks) had seven rebounds each. GFA qualifies for the FAA Tournament and will play at Sacred Heart on Tuesday. Earlier in the week, against Hamden Hall, the Dragons fell behind by a 13-0 score, only to bounce back to take a 31-30 lead before the host Hornets pulled away down the stretch for a 72-46 win. Marcus once again led the Dragons in scoring with 22 points. Van Hoesen added nine points while Litt scored six. Van Hoesen also hauled down eight rebounds while adding three steals and two assists. Litt and Marcus tallied six boards each. While preparing for this week’s New England tournament, the Dragons hit the road and posted a 7-0 win over Kingswood-Oxford on Thursdy. Duda Voldman (Stamford), Jack Soper (Darien), John Selkowitz (Norwalk), Will Mackle (New Canaan) and Blake Newcomer (Greenwich) all won by 3-0 scores. Marshall Bessey (Darien) and Jeb Rooney (Darien) both pulled out 3-2 matches. The Dragons defeated host King on Monday, edging the Vikings by a 4-3 score. Clare Foley (Southport), Julia Edwards (Westport) and Annabelle Kreitler (Fairfield) both won by 3-0 scores. Foley won 11-4, 11-9, 11-7, Edwards won 11-5, 11-7, 11-1 and Kreitler won 11-7, 11-4, 11-6. Samara Cohen (Westport) earned a 3-1 win at No. 6, 11-4, 11-2, 7-11, 11-3. Katie Mackle (New Canaan) earned GFA's only point with a 3-0 win at No. 1 singles, but the Dragons battled tough in a 6-1 loss to Kingswood-Oxford on Wednesday. Edwards (11-3, 15-13, 12-10), Kriteler (11-5, 12-10, 11-7) and Kate Millard (Southport; 11-2, 11-7, 12-10) were involved in especially close matches. It was the final home matches for Mackle and Ellen Burbank (Southport), the team's two seniors.